The Haws 1107LBP Drinking Fountain is a wall mounted barrier-free unit. Shall include a 14 gauge Type 304 Stainless Steel satin finish basin with back panel and integral ¼" stainless steel mounting plate, antimicrobially treated push-button, bubbler head, waste strainer and trap to protect against the growth of mold and mildew on the treated components. 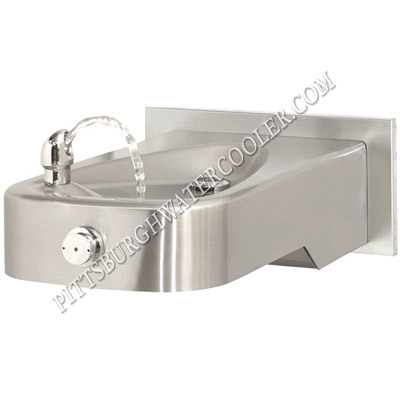 Push-button operated valve with front-accessible cartridge and flow adjustment, polished chrome-plated brass vandal-resistant bubbler head, polished chrome-plated brass vandal-resistant waste strainer, vandal-resistant bottom plate, and a 1-1/4" IPS internal trap. Unit can be mounted to meet ADA or Child ADA specifications. Perfect for schools, airports, shopping malls and other high traffic areas. When installed properly, the heavy-duty, low profile design of the 1107LBP meets all current Americans with Disabilities Act requirements while providing an integrated trap that is ideal for quick installation, and can easily be installed on concrete or solid walls eliminating the need to provide "in-wall" trap access. The vandal-resistant bottom plate and 1/4" integral mounting plate also bring added peace of mind. Specific components are antimicrobially treated using the natural protection of silver. Silver helps protect against the growth of mold and mildew on the treated components. Treated surfaces include bubbler head, push button, waste strainer and trap. Low profile designed bowl and integral trap that is set back for knee clearance allows for adult or child ADA access (when installed at appropriate heights). Haws Part# BP7 - Stainless steel satin finish back panel.